Sometimes when you're reading Neal Stephenson, he doesn't just seem like one of the best novelists writing in English right now; he seems like the only one. No other author embeds characters in an authentically contemporary Web of technological connections the way Stephenson does. His characters text and tweet and play massively multiplayer games. When they check their e-mail, they do it on their phones, not their computers; when they make phone calls, they do it on their computers via Skype, not their phones. You can see why other writers let this stuff slide. You have to come up with new kinds of stories in a networked world. The usual missed connections and mistaken identities don't cut it  how many Shakespearean tragedies could have been averted with GPS and Facebook? Not that we don't have problems now, God knows, but when you take our modern technological predicament seriously, you realize that those old problems have to be rerouted, and that the stories have to change shape accordingly. They start to become less about missed connections and more about overconnectedness. They start to look like Reamde. 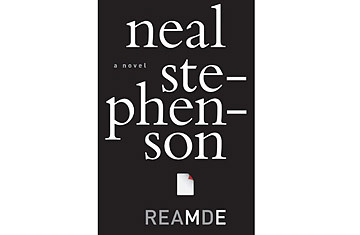 Reamde is Stephenson's 10th novel (not counting his occasional collaborations and the unclassifiable online fiction project The Mongoliad), and he has yet to write an uninteresting one. In Reamde we find him slimming down to middleweight after five straight heavyweight bouts: the cryptographical epic Cryptonomicon, the 2,500-page three-novel Baroque Cycle and then Anathem, a philosophical novel set on an alt-universe earth where monasteries are consecrated to higher mathematics. Stephenson's abiding preoccupation is information flow, and how information shapes the lives of the humans around and through whom it flows. He is generally tagged as a science-fiction novelist, but that categorization is difficult to support on the evidence  the Baroque Cycle was set in the 17th and 18th centuries and stuck to existing history, more or less. (Isaac Newton is a major character; the action turns on his little-known role as Master of the Mint.) "Science fiction" describes Stephenson's interests, but not his methods. While recognizably Stephensonian, Reamde is less about the flow of information through global networks than it is about the flow of bullets out of guns. This is, first and foremost, a Bourne-style international thriller, and as such its intellectual sites are set lower than those of its immediate predecessors. The hero of Reamde is  or at first appears to be  Richard Forthrast, founder of a World of Warcraftesque massively multiplayer fantasy game called T'Rain. Richard is an amiable enough guy in his 50s, living in Seattle, with way too much money and way too little in the way of emotional or, for that matter, physical connections to the world around him. This changes when he hires his niece Zula, an Eritrean refugee adopted by his sister, and takes a mentor's interest in her. The pace of Reamde is rapid and unwavering  the plot automatically extrudes twists, new settings and even fresh major characters at precisely calibrated intervals. The characters ping-pong around the globe as if geography were an afterthought and communicate via a pidgin English largely based on video games, which is their shared frame of reference. These are people who, in any earlier incarnation of human civilization, would never have met one another. But now they have, and not because they wished to, but because the logic of money and information requires it, and because the now flat, frictionless earth no longer has the power to keep them apart. But the story of Reamde is mostly there as a superstructure for Stephenson's observations about how the world around us actually works  the background is the foreground. There's a marvelous sequence late in the book when the characters become transfixed by what's happening on a computer, and Stephenson, without pausing or even slowing down the action, weaves in a concise explanation of how a computer monitor works and why it looks the way it does. You don't bog down in it  the explanation is the action and the moment feels real, because we understand not just what's happening but also why and how, down to the submolecular level. This realness serves Stephenson's themes well: he likes to play with the sharp sheer between the world as it is and how it appears in the cartoon looking glass of pop culture. Asked why the Russian criminals think he and Zula can find the author of Reamde, a no-nonsense Hungarian programmer replies, "Because we are hackers, and they have seen movies." The joke of watching a bunch of video-game addicts get caught up in actual shootouts never gets old: right in the middle of a finely turned Mexican standoff on a dock in Xiamen, the terrorist delivers a lecture on the eccentricities of the firing mechanism of the Makarov pistol that his opponent is holding against his head. In Stephenson's world, victory generally goes to the guy who's read the manual. If there is an overarching theme to Reamde, it's the importance of drilling down through easy bull---- explanations to the tough, complicated substrate of the real world beneath  the importance of not satisfying yourself with the vague approximations of video games and, for that matter, sub-Stephensonian writers. Toward the end of the book, Richard, the archillusionist of T'Rain, finds himself on the run and in desperate nonvirtual danger, but instead of despairing he finds his situation perversely exhilarating: "No one could reach him via phone or e-mail, Twitter or Facebook, and bother him. His whole mind, his whole attention was focused on one thing for the first time that he could remember." It's worthy of note that Stephenson  an early prophet of virtual reality, whose novel Snow Crash materially influenced the development of the Internet itself  is less interested in the consensual hallucinations of cyberspace than he is in the stuff we use it to escape from. The Internet is all well and good, but reality is still the ultimate hack. See TIME's video about the scientific mind behind Flash Forward. Read about the Top 10 Everything of 2008.